Today I’m bringing you two short and sweet technical tips to help you achieve a more reliable breath support. To improve your breath support, it all begins with words. That’s right. . . . not the air, not your diaphragm, not your lungs. . . . words! The words we use to direct ourselves in our technique and around our support REALLY matter. Changing words shifts understanding. A new understanding shifts mindset. And a new mindset results in a new physical response which helps your body work for you instead of against you in accessing your most efficient singing technique. I love clever life hacks (who knew a balled up piece of tin foil makes a great substitute for steel wool??). 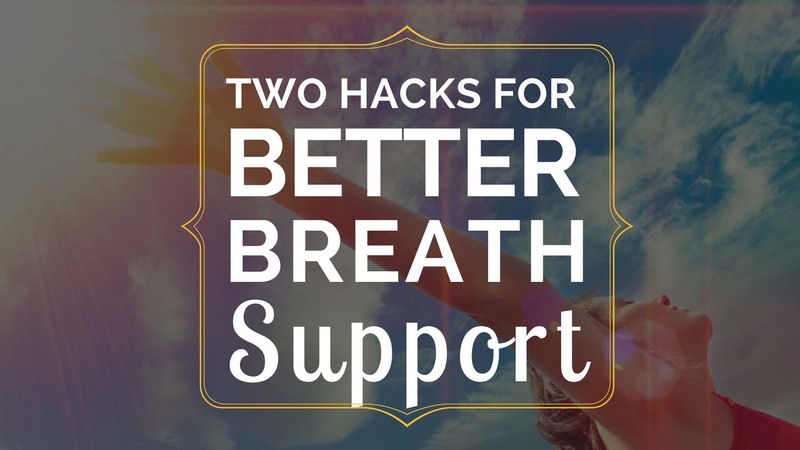 Consider these breath support tips my version of clever singing hacks. They are achieved by merely changing a few words! “How To Sing With Appoggio” has really good explanations and exercises for how to find and feel your support correctly in your body. Understanding and utilizing these tools can go a long way to improve your breath support. “Two Breath Support Myths Dispelled” addresses two of the most common mistakes/misconceptions singers have about breath support and how to avoid them. “Don’t Ignore What’s Behind You” explains why the back is so essential in breathing for singing and supporting your sound. It gives you exercises for how to utilize the back body in singing.